Is the Historical Context of Mental Illness, really historical? The current Medical Model of Mental illness takes the view that our mental health can be categorised, diagnosed and treated in the same way as physical illnesses. This approach is not without its critics who take the view that the medicalisation of human experience is more of a feature of societal control for the political and economic classes to be able to manipulate behaviour to their own whims. The view, however, that these views are a thing of the past could be considered to be an ethnocentric one. Consider the question, is the medical model sociologically still in the minority? With the DSM (US), ICD (WHO) and CCMD (China) as the major classifications systems accounting for coverage of the US, China and the rest of the world there is technically full coverage from the ‘Top down’. What about the bottom up? To what extent are personal beliefs resistant to a more enlightened medical approach to mental illness? Below is a case that recently has been brought to light in Nicaragua of how one woman’s behaviour was demonised rather than medicalised. The sad case highlights the role of how a mixture of poverty, strong religious beliefs, the role of the supernatural, how women are ‘controlled’ as well as the lack of education can be a recipe for the most extremes of response. Reader discretion advised. A new era of the Gene Jeanie….. The original journal article (Sekar, 2016) the headline relates to proposed that ‘synaptic pruning’ occurs at pivotal points in development, however, excessive pruning during adolescence are matched to the symptoms experienced by Schizophrenics. The regulation of an individual’s synaptic pruning is specifically related to the gene ‘complement component 4‘ referred commonly to as ‘C4’. It has long believed that Schizophrenia had an innate component, however, the difficulty in systematically testing the impact of the environment meant clear conclusions have always been difficult to draw. The Diathesis-Stress Theory suggest that Schizophrenia could be caused by a biological vulnerability (diathesis) triggered by environmental factors (stress). Gottesman and Shields (1972) classic study attempted to pull research in the area together, by analysing a range of adoption and twin studies including dizygotic (non-identical) and the rarer monozygotic (identical) twins, which only occur 3 in every 1000 live deliveries worldwide. All adoption studies found an increased incidence of schizophrenia in adopted children with a schizophrenic biological parent. Kety (who was also known for his critique of Rosenhan’s study) found that biological siblings of children with schizophrenia showed a much higher percentage of schizophrenia. All twin studies found a higher concordance rate for schizophrenia in monozygotic (MZ) than dizygotic (DZ) twins. In Gottesman and Shield’s own study the rate was 58% for identical twins, and 12% for non-identical twins. The research was strongly suggestive of the genetic influence even back then, however, only took a reductionist biological view, largely ignoring the diathesis-stress model even though the results seem to support it. Is the genie finally out of the bottle? The current Sekar 2016 research is an exciting development in answering the questions of the biological cause of schizophrenia as well as how an effective treatment may be developed. Watch this space…. An article discussing a wide range of twin and adoption studies investigating Schizophrenia. The Psychology of Decision Making in a Setting with Consequences. A Jury’s decision at the end of a criminal case has been an established part of English law since 1168 when the first murder trial took place. Benedict Graymond was tried and founder guilty for murder using a garden tool. 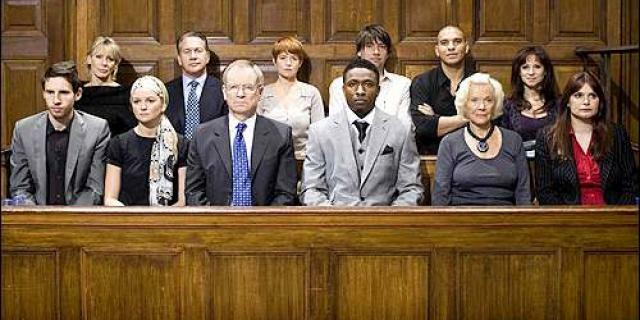 How did the jury then and the ones that take place today come to their conclusion, is it a rational and considered analysis of the evidence culminating in the majority decision, beyond reasonable doubt of a group of ordinary citizens (peers) or, are there key social cognitive elements influencing the final verdict that could be confounding? The answer is most likely a combination of both. A key flaw into research investigating how juries reach a verdict, is the extent to which they are both reliable and ecologically valid. The Royal Commission on Criminal Justice (1993) recommended that section 8 of the Contempt of Court Act 1981 should be amended to permit genuine academic research but this was not implemented. This law prohibits any person to obtain, disclose or solicit any particulars of statements made, opinion expressed, argument advanced or vote cast by members of a jury in the course of their deliberations. The discussion of the evidence of a case is therefore singularly considered by 12 individuals over the age of 18 and up to 70, making up the jury. Hastie’s influential 1983 book investigated a range of issues relating to jury decision-making including the contents and dynamics of the deliberation process. Using primarily Mock trials, which is a close simulation of a full trial with all aspects replicated and observed however without the inevitable consequence of the jury’s decision the verdict, Hastie attempted to piece together the nuances of trial by jury. The Mock Jury could be recorded, filmed, their interactions and discussions dissected and analysed to identify the secrets of the decision-making process. However, without any consequence to the decision, either guilty or not guilty the weight of that decision is purely academic. How is it possible to replicate the bias, unconscious or otherwise, the empathy with the victim or defendant and knowing your decision is contributing to possible life-altering or even life-threatening consequences? In the U.K, the evidence of the case is presented and examined in front of a judge and jury by the defence and prosecution in an adversarial approach to justice, compared to the inquisitorial where it is the Judge that takes the active role and the presentation of a bias case is avoided. The adversarial approach, therefore, allows for a degree of persuasion of either how to view the context of the evidence or the credibility of a witness. There are many ways in which a barrister, may try to influence the jury many of which are well documented in psychology. For example, Hovland’s Yale Model of Communication identifies a range of factors that increase rapport and influence to provide a more persuasive argument. The credibility of the source, the message itself, the medium in which the information is being given, who is the target audience and the formality of the situation are all key. The model isn’t a specific forensic model as it is used widely in health and business situations, so is there any forensic research investigating methods of how the message is presented that can have a significant impact upon the verdict? Cognitive Psychology has long provided experimental evidence to support the view that information taken in at the beginning and end of a set of data tends to have the greatest level of recall. This is known as the Primacy/Recency effect. 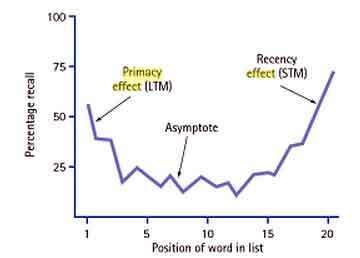 The serial position curve (below) shows where information tends to have the highest level of retention, based upon whether they have had enough rehearsal to be stored in the long-term memory or as in the case of the recency effect are still fresh in the short-term memory. Below are the results of Murdock (1962) providing evidence to support this idea. If this is applied to the order of which a barrister decides to place their witnesses to have the biggest impact it would follow to put their strongest witnesses at the beginning or end, irrespective of where they fit in the narrative of the crime. This technique to persuade the jury by manipulating the order that the witnesses are presented is called ‘Witness Order’. The alternative method often employed is to keep the order of witnesses presented in court consistent with the order of the narrative or story of events, this is referred to as ‘Story Order‘. 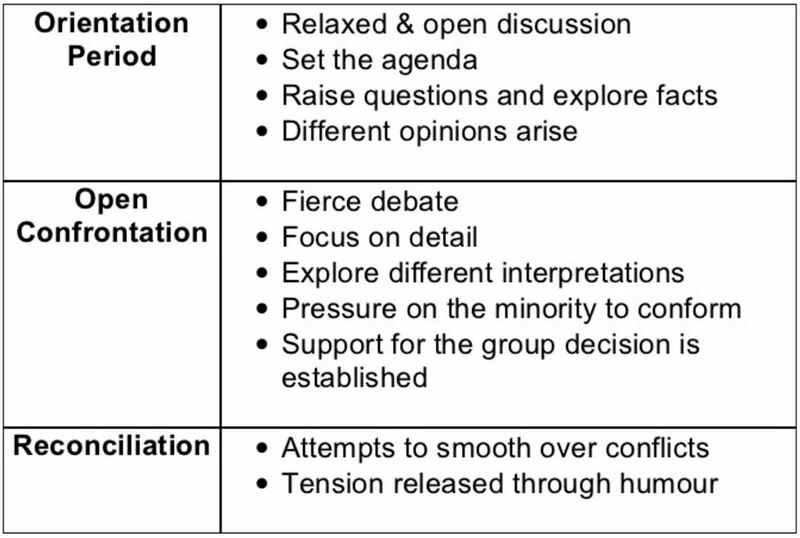 Pennington and Hastie conducted a piece of research to investigate using a mock trial the effectiveness of the two approaches. The results showed a lack of construct validity for the impact of the primacy/recency effect in the context of ‘Witness Order’. So why didn’t it work? Murdock’s original study, like many memory based laboratory experiments, was based upon very simplistic single words whereas the complexity and nuances of content in a trial is vastly different. The information is far too complex to simply be taken at face value of a over simplistic input, storage and retrieval model. Pennington and Hastie discussed that jurors were likely to naturally reassemble the chronological order of events to give them the best opportunity of understanding them, into a schema or story and therefore the altering of the order just confused that process, especially when the alternative approach of ‘Story Order’ was based upon that idea. What can we learn from Pennington and Hastie’s research? 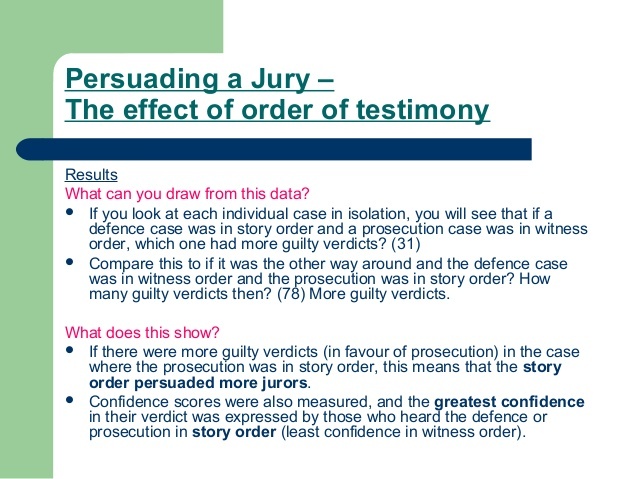 The applied context seems to be clear; Story order is likely to be the most persuasive method of presenting witnesses in court and if the adversary is using witness approach – the impact will be all the greater. The application of Social Psychology within the courtroom. One of the most well-known pieces of Social Psychology investigation the notion of conformity was conducted by Stanley Milgram’s mentor, Solomon E. Asch (1951). Asch conducted a piece of research investigating the extent to which participants would change their response to a highly simple task on the basis that their answer would conform to that of the rest of the group, even if it was obviously incorrect. Asch set up a situation where a group of men were given a simple line comparison task to complete, with each in turn speaking out their answer. Simple. Asch manipulated the situation by ensuring only one person in the room was a naive participant whilst everyone else was part of the research, a confederate, a stooge of Asch’s. Would someone really knowingly give an incorrect response to ensure they didn’t go against the majority view? If it does happen then this may have major consequences for the reliability of jury decision making. On average 1/3 of participants changed their response as a result of majority influence. This effect dramatically reduced when 1 other person gave a different answer -it seems, in the laboratory at least, you only need 1 ally to have the courage of your convictions. However, once again we have the consequence issue, Asch’s research was done in a very artificial environment completing an artificial task, how much confidence can Forensic Psychologists have in the role of majority influence changing decisions in an actual jury deliberation. Again ‘mock juries’ can provide some insight in terms of the impact of a complex task in addition to a formal setting but we are still without those all important consequences of the decision and thus ecological validity. Nemeth and Wachtler were interested in another area of social influence, that of minority infleunce. Could the consistent and seemingly autonomous, (acting out on one’s own decisions) persuade the wider group to come to one person’s view? The famous courtroom drama ‘12 Angry men‘, used this idea as a plot to show how a single voice could win over the many. Review Nemeth’s research below- do you think it could occur outside of an experiment and a film? Many psychologists take the view that it is indeed the small dissenting voices that over time can shift the views of many and society’s views. The Suffragette movement could be one example of an initially minority view being accepted by the mainstream and changing the law. When you think about it there have been many shifts in societies views that were once the view of the few. The role of Attractiveness influencing the jury’s decision. Edward Thorndike coined the term ‘Halo Effect‘ to describe The Constant Error in Psychological Ratings’. A form of bias that seduces and individual of having their perception of someone shaped by a single characteristic usually typically their attractiveness, (The ‘Horns effect’ is the opposite paradigm). Are we so superficial as to be taken in by someone just because of the way we look? Watch the video to take a look at how it works. Castellow decided to investigate how attractiveness might influence a jury. Castellow found that there was a statistically significant difference between how jurors viewed attractive vs unattractive defendants. Attractive defendants were found guilty in 56% of cases where it was 76% for the unattractive ones. This research and many like it has confirmed this finding, however again only mock trials could be used reducing the ecological validity. However, it can be said that a defendant may want to ensure they are perceived in the best possible light by the Court by providing a smart appearance. The evidence could also be argued to support Lombroso’s view of the criminal man. Is there a downside to being attractive? Some new thinking and research in the area may shed doubt on the universal appeal of the halo effect. Confidence as a variable for persuading the jury. A consistent and autonomous approach has been seen to persuade a majority to a new way of thinking (Nemeth), so it follows that an individual who is confident may also excerpt a similar degree of influence. Penrod an d Cutler conducted research manipulating a range of factors to measure their impact on a jury. Using a sample of undergraduates, eligible and experienced jurors, Penrod et al showed a videotaped trial of a robbery was shown in which eyewitness identification played a key role. The witness testified that she was either 80% or 100% confident that she had correctly identified the robber. There were nine other variables all at both high and low levels, depending on the conditions. The participants experienced either the high or low condition variables on a random basis and were asked to decide whether the robber was guilty or not guilty after watching the film. Witness confidence was the only statistically significant variable. The evidence in this field is consistent in showing that confidence is a poor predictor of witness accuracy. Furthermore, the trust that jurors place in the confidence of the witness is undiminished even if the judge advised the jury to be wary of it. The notion of free will is still a matter of huge debate in Psychology. As many approaches (Social, Cognitive et c.) are trying to provide singular deterministic factors establishing cause and effect however without a unifying paradigm, the discipline will always be fragmented. Maybe free will is one of the missing elements that would contribute to a more unified psychology? Reactance theory, Brehm (1968), suggests that when someone’s notion of freedom to choose a specific course of action is threatened this motivates them to actually be more likely to exhibit that behaviour, to reassert their free will as a form of reactance. When we are vigorously told not to do something this motivates us to actually do it. Pennebaker and Sanders (1976) put one of two signs on University bathroom walls. One read ‘Do not write on these walls under any circumstances’ whilst the other read, ‘Please don’t write on these walls.’ A couple of weeks later, the walls with the ‘Do not write on these walls under any circumstances’ notice had far more graffiti on them. This is often also referred to as the ‘backfire effect‘, the notion that someone is trying to persuade someone else so much and it backfire’s as they do the opposite. Pickel (1995) applied this to a court setting. Could Barristers manipulate/persuade the jury into having a reactance against the judge? In court, there are some types of evidence that are not allowed, due to being collected illegally (such as wire taps), or it is unreliable such as polygraph results? What if, for example, the prosecution introduces evidence that they know is ‘inadmissible‘ knowing that the Judge will have to tell the jury to ignore it? This may then motivate at least some of the jury members to react against the Judge’s orders of ‘not taking any notice of the evidence’ and actually persuading them otherwise. In Pickel’s research participants listened to an audiotape of the trial, which contained a piece of critical evidence. The critical evidence was information about a prior conviction of the defendant’s, which therefore, favoured the prosecution team and would have been inadmissible. The critical piece of evidence was a prior conviction of the defendant. The item was objected to by the attorney of the defence team. The conditions varied at this point, some participants would hear the judge allow the evidence and the others would hear it disallowed. When the jurors were instructed to ignore the inadmissible evidence this ruling was sometimes supported with a legal explanation. The judge would express that the evidence should be disregarded as it might be suggestive of bad character and bias the jury members. In one of the conditions no legal explanation was given when the evidence was ruled as inadmissible. State how much the knowledge of the prior conviction caused them to believe the defendant was guilty on a scale of 1 to 10. Give a rating of the credibility of each witness. Calling attention to inadmissible evidence makes it more important to the jury and they pay more attention to it. This has some real life application as it is a tactic that could be used by prosecution and defence to draw attention to specific pieces of evidence, which may confound upon the juror’s verdict despite being ruled as inadmissible. The right to a fair trial – Does the use of shields in Court give an unfair advantage? witnesses, young and old, is gathered reliably and without bias. The Memorandum of Good Practice (1992) provides a range of techniques and methods to ensure that a child can provide a coherent testimony. This is important as Psychologists have identified how the testimony needs to be perceived as credible by the jury if it is to be believed. This is defined as; Credibility Inflation: when the child’s testimony is more believable, because they are not so distressed and can answer questions in a confident way. Credibility Deflation: when the child’s testimony is seen as unreliable, because they are distant and needing special support. Such methods of support could be a shield to provide a physical block between witness/victim and defendant, another method is to provide a video link to another part of the court, to again allow a reduction in anxiety of the witness. Does this imply guilt? Does this bias the jury to a viewpoint that the defendant is so dangerous that physical barriers are required to ensure everyone’s safety, thus confounding the right to a fair trial. Ross et al 1994, conducted research investigating the impact of both shields and videotapes, using a mock trail. They found no significant difference in the percentage of convictions. The control group received 51% guilty verdicts, The Shield: 46% and Video: 49% a nominal variation of 5% between all condition. The findings show no significant difference across the conditions a guilty verdict was slightly more common in open court and slightly less likely when the child was screened, but these differences are not statistically significant. These results suggest that protective shields and videotaped testimonies can be used for child witnesses in a way that does not prejudice the jury against the defendant, but it is important that these measures are used carefully. It seems clear that there are seemingly many factors that can influence in the courtroom, attractiveness, the role of shields, the order in which evidence is presented, the confidence of a witness, the strength of a Judge’s instructions to ignore evidence as well as key influences within the deliberation room, the role of the majority and the influence of the minority, however all of these pieces of evidence have been collected using artificial environments and therefore, their application to real-world settings are always going to be difficult to confirm. One case of a jury’s deliberation was confirmed, the jury could not decide whether a defendant was guilty of murder and so decided to contact the victim to ask…via a Ouija board. The Jury returned a verdict of guilty. One jury member spoke up allowing the defendant the right to appeal, however, the original verdict was maintained. There are many other issues such as age, race and gender that also have been explored using similar mechanisms. UPDATE Nov 2015; Read the story here of a juror who was so bored that she posted her thoughts on the case…to Facebook! Brian H. Bornstein, PhD, University of Nebraska–Lincoln March 2008, Vol 39, No. The Warrior Gene; A genetic predisposition for violence? In philosophy and psychology, the nature Vs nurture debate is the oldest dispute to be had and still very much rages on. Most views take an interactionist approach, taking the view that human behaviour is a meeting between genetic predisposition and that potential shaped by experience. However, there are some basic human behaviours that are so entrenched that they are considered to be almost purely constitutional such as aggression. Freud believed that aggression was an innate force caused by hydraulic drivers and displacement. However, modern science allows access to information that allows us to look at he genetic makeup of an individual at a micro level. MAOA (Monoamine Oxidase A) is protein-coding gene like the other 24,000 genes making up the human experience. MAOA is an enzyme that metabolises monoamines, such as serotonin, norepinephrine and dopamine. A version is referred to as MAOA-A, also known as ‘The Warrior Gene‘. Brunner’s syndrome is isolated to 14 individuals as part of the extension of the same family and therefore, does not give much assistance on our understanding of wider criminality in society, however, it has prompted research into the natural variations in levels of MAOA coupled with childhood experience to give a more generalised account of aggression, anti-social behaviour and criminality. 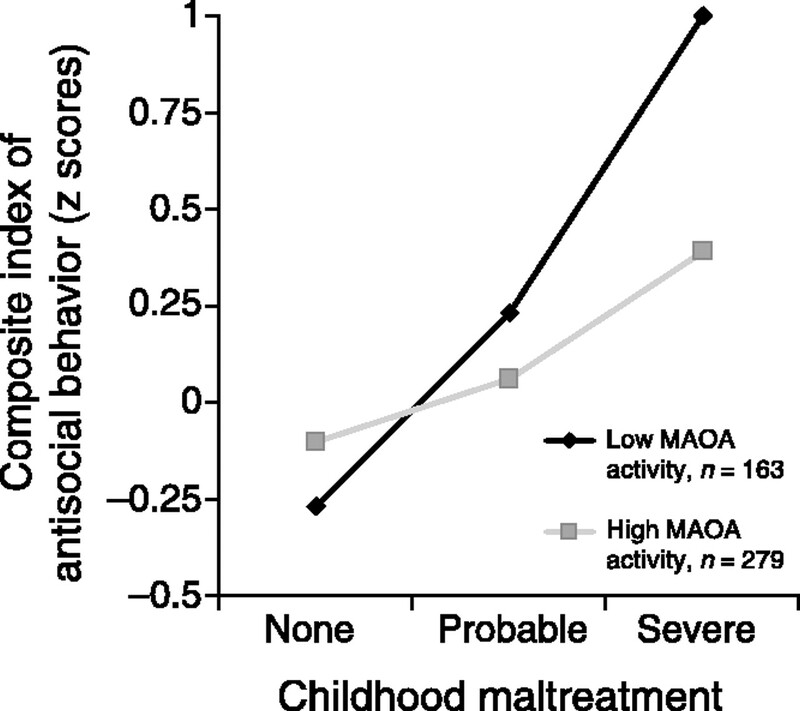 One key piece of such evidence is that of Moffit and Caspi (2002), as can been seen from the results below the trends for antisocial behaviour becomes elevated with the genetic predisposition of low MAOA activity. Read the full study here. So it seems the Nature Vs Nurture debate for aggression and criminality is still deciding the key factors between the interaction between the two and which exerts the most influence. Or is the naturally occurring ‘Warrior gene’ an atavistic device acting as a defence for the human race – like human army ants? Kevin Dutton has created a Psychopath test. For a short time Phineas may have been unconscious. His gang carried him to a nearby ox-cart where, sitting against its head board, he was driven to the Cavendish inn where he lived. He alighted unaided. Then from a chair on the ‘piazza’ he told his story to the bystanders. He greeted Edward Higginson Williams, the first medical practitioner to arrive, with ‘Doctor, here is business enough for you’. A 25 year old Phineas Gage is a name synonymous with biological explanations to criminal behaviour. Reportedly a mild mannered individual who after having a significant brain injury from a tampering iron transformed him in terms of his behaviour and personality, giving rise to a new way of thinking regarding the relationship between brain and behaviour. But how accurate are the stories of this seemingly Jekyll and Hyde case….? An article published be the British Psychological Society via Malcolm Macmillan is Professorial Fellow in the Department of Psychology at the University of Melbourne is attempting to put the record straight. Click on the picture to read about this fascinating case. Find out here what the textbooks don’t tell you about Phineas Gage! The ‘Margaret Thatcher Effect’ as it was first done with an image of her. Processing faces can sometimes be difficult. 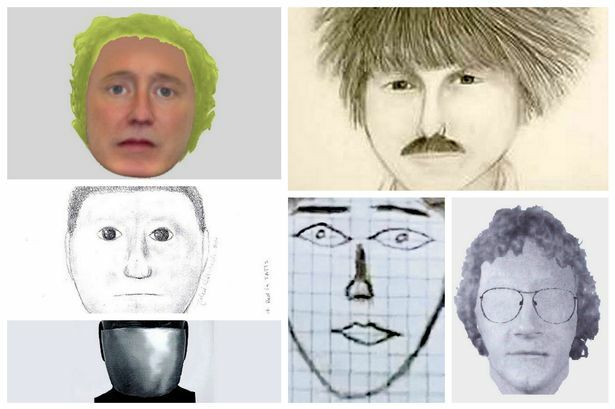 With the advent of computer systems, there is an opportunity to create an ever m ore sophisticated method of reconstructing faces to aid the police (Bruce, Frowd, and Hancock). However, such devices while impressive in their ability to create something that looks like someone they still depend upon the reliability of the minds cognitive processes to accurately recall unique information about the features of the face, was that a Roman nose, were they olive shaped eyes? Research suggests humans have a natural inclination to process and recognise faces above all other information from an evolutionary perspective this makes a lot of sense. However reconstructing from recall those faces does not come as easily. Factors such as ‘Weapon Focus’ (Loftus, 87) and post witness identification influences such as confirming feedback (Wells and Bradfield 1998) call into question the accuracy of any eye-witness testimony. Pawan Sinha published an influential article on key factors that impact upon the accuracy of facial reconstruction read it here. Try a facial recognition test here. The variability of someone’s ability to accurately recall a face can be seen evidently below….. The difficulty of constructing faces from our memory has been known for over 30 years (e.g. Davies, 1978). We are not good at the tasks required – describing and selecting individual facial features – instead we process faces ‘holistically’, more as a complete entity (e.g. Young et al., 1987). 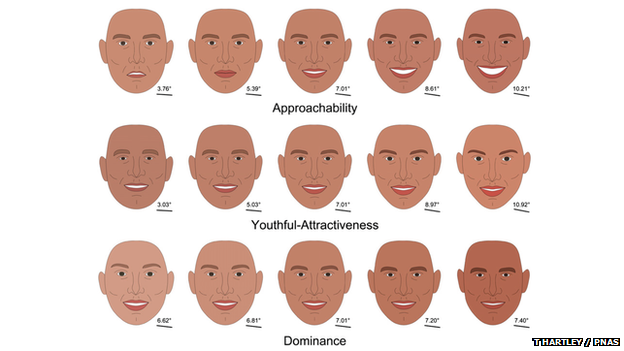 For example, the perception of facial features changes in the presence of other features (e.g. Tanaka & Farah, 1993), and so the features and their position on the face are both important. Modern facial composite systems, where witnesses choose individual features in the context of a complete face, apply this idea to some extent. However Evofit can and does prove accurate and, therefore useful, and the infamous ‘Beat of Bozeat’ case was such an example. Frowd and Bruce used this as part of their research. The use of ‘Holistic’ based software such as EvoFit allows factors such as trustworthiness or aggressiveness can be added in the face as Sinha identifies recall of faces tend to be greater when we have associated an emotional component to them. Watch below how the Police are using ‘EvoFit’ recognition, of faces rather than actively trying to recall features in their work with witnesses. Frowd & Bruce also conducted some different research attempting to investigate the importance of internal and external features when recreating faces. Do we have cognitively process internal and external features differently based upon our familiarity of the individual or is there a difference in accuracy just because internal features are more difficult to replicate? –Read the study here. The Police are now using ‘super recognisers’ to spot faces in large crowds to assist with identifying criminals! Find out how difficult it is trying to reconstruct a face from memory use the software here to create the face of someone you know but isn’t present. Consider why it is so difficult. The Cognitive interview is derived from a range of sources of cognitive evidence relating mainly in the psychology of memory. It was formulated by combining a number of techniques to assist in allowing an interviewer, such as a police officer, to provide conditions that would allow for the greatest level of accuracy possible, in essence a systematic set of tools to allow access to someone’s memory without inadvertently altering it or not gaining the full insight due to poor phrasing. The Cognitive Interview (CI) is primarily used for witnesses and victims as it needs to assume a willing party. Suspects cannot be relied upon to tell the truth for obvious reasons, hence alternative approaches have been created for their interviewing, such as the controversial Reid Technique. The Cognitive Interview can also be used with children as witnesses, which is a significant advancement in police methods as to the historical ‘credibility deflation’ of child interview that were considered to be unreliable as to a lack of confidence or a change in responses due to demand characteristics (Samuel and Bryant). Fisher and Geiselman conducted research investigating the effectiveness of the Cognitive Interview. 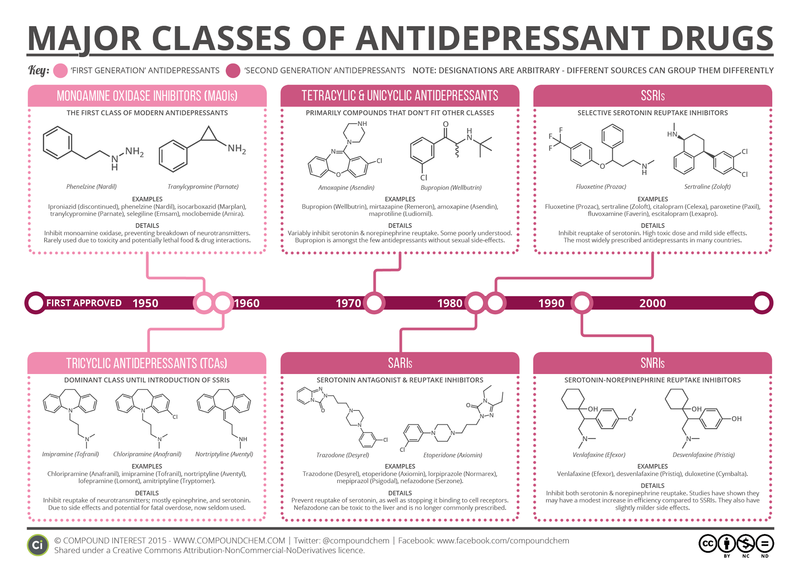 The history and classes of antidepressants….. The reason I’m not a neurobiologist but a cognitive psychologist is that I think looking at brain tissue is often the wrong level of analysis. You have to look at a higher level of organisation. The Cognitive approach was initially contrasted with Behaviourism, especially in the US where the highly experimental, yet limited perspective was seemingly running out of steam, where Behaviourism was only interested in the external, observable and measurable phenomena Cognitive Psychology wanted the same experimental approach but took the view that the internal thought processes often compared with a ‘computer‘, was an area of study worth pursuing. What are the processes within the mind shaping thought? What were their limitations and are they fixed? Were they applicable to all, was there a ‘human’ base model that all shared that culture and experience then could mould? One such example, many will be familiar with terminology like short-term and long-term memory as an example of our early Cognitive Psychology devised simplistic models to represent how complex processes of memory interact. George Miller’s 7(+-2) to represent the ‘capacity’ of Short Term Memory that then produced ‘chunking‘ to seemingly generate a hack to get around the limitations of our own systems. For such hard wired or ‘hard-coded‘ (to maintain the often cited computer analogy), these ‘rules of thought’ were systematically studied to provide support for cognitive psychology which became the new face of experimental psychology generating memory tasks to provide evidence of our how these cognitive systems worked. However, many studies produced basic lists of words and objects to produce effects whilst interesting were deemed to have little ecological validity. The classic 1935 Stroop Test illustrates both the seeming limitations of our cognitive processes through a task that has very little generalisability to real word tasks. Take an interactive test here. However, no ‘process’ was left unturned perception, problem-solving, attention, language and memory historically the key areas of Cognitive Psychology. Whilst conducting highly controlled experimental work to build a body of evidence using a Nomothetic approach, some took an interest in the variations in people’s thinking whilst others took a more idiographic approach interested in the case studies of individuals whose thought processes were seemingly ‘faulty’ or ‘erroneous’. Consider how visual illusions work. They take advantage on how our perceptual sets are fixed which means anything we are presented with that sits outside of that our mind has to either attempt to adjust or it produces an image that we cannot understand. 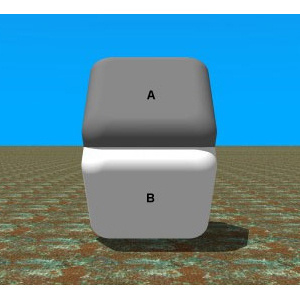 The faces of A and B are the same shade. Place your finger horizontally where they meet to prove it! One such case was that of Henry Molaiso (referred to as HM). Aged 27 needing brain surgery HM had both parts to his ‘hippocampus‘ removed when receiving surgery to assist his epilepsy. What wasn’t known then is the Hippocampus structure is now thought to be crucial in the development of new memories. However, for reasons still not completely understood (often thought to be the result of the heavy medication for the epilepsy) HM had no memory of events for the 11 years prior to the operation and unable to make new ones. This is referred to a global amnesia constituting a completed lack of memory both prior (retrograde amnesia) and after (anterograde amnesia). HM therefore, became a man whose memory finished when he was 16 years old without any way to process new memories. A similar case is that of Clive Wearing watch the video below for an insight into a life where memory doesn’t exist. B.F. Skinner criticises the cognitive approach as he believes that only external stimulus – response behavior should be studied as this can be scientifically measured. Therefore, mediation processes (between stimulus and response) do not exist as they cannot be seen and measured. Skinner continues to find problems with cognitive research methods, namely introspection (as used by Wilhelm Wundt) due to its subjective and unscientific nature. Humanistic psychologist Carl Rogers believes that the use of laboratory experiments by cognitive psychology have low ecological validity and create an artificial environment due to the control over variables. Rogers emphasises a more holistic approach to understanding behaviour. The information processing paradigm of cognitive psychology views that minds in terms of a computer when processing information. However, there are important difference between humans and computers. The mind does not process information like a computer as computers don’t have emotions or get tired like humans. Behaviourism assumes that people are born a blank slate (tabula rasa) and are not born with cognitive functions like schemas, memory or perception. Work by Elizabeth Loftus investigating how easily a ‘normal’ memory can be distorted by simple language is one of the most well-known works in Psychology. However, not exempt for ecological validity issues it is still one of the most stark examples of how memory is malleable and easily altered. Particularly useful in the realm of Forensic Psychology and the ease in which eye-witness testimony can be falsely relied upon. Test your knowledge of that research –here. ‘like a Wikipedia page you can go and change it….but so can other people‘. 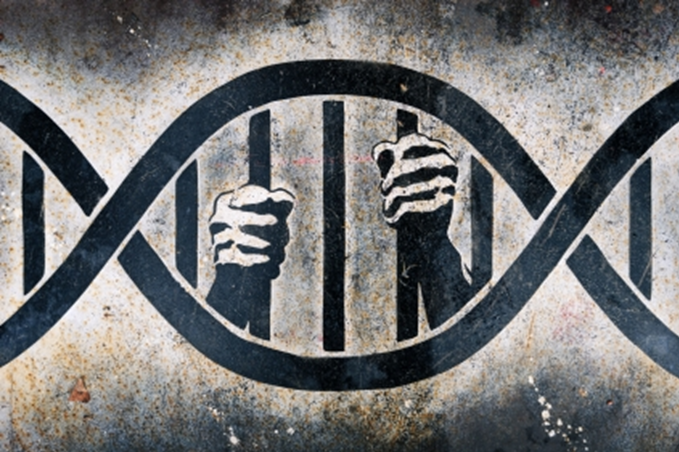 Do criminals have a distinct and measurable set of thinking patterns? Yochelson and Samenow attempted to find out. Cognitive Behaviour Therapy (CBT) is a generic term for a therapeutic approach to psychological disorders developed out of a need for an alternative from the more traditional therapeutic Psychoanalytical approach. Cognitive Behaviour Therapy aims to restructure thoughts of individuals who are suffering from a range of disorders from anxiety and depression. Do those suffering from depression have a distinct set of thought patterns – Beck tempted to find out? Have a look at Beck’s research into CBT when compared with Drug therapy. Influential Psychologist Albert Ellis developed Rational Emotive Therapy (RET) in the 1950’s with Psychologist Aaron Beck leading the way for psychotic disorders such as Schizophrenia from the 1970’s. CBT is also being used to treat ‘insomnia’. Have a look at Beck’s research into CBT when compared with Drug therapy. 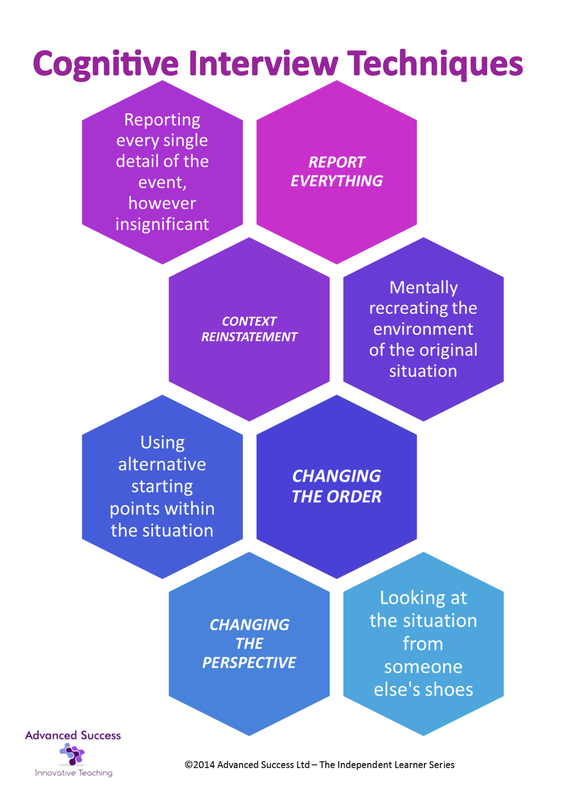 Below shows the progression from Cognition (thought) to the Behaviour (Actions) that have been reframed by using CBT, comparing the initial ‘faulty’ thinking. Mindfulness is fast approaching CBT as a preferred method of dealing with anxiety without drug therapy. And here is an article critiquing CBT as a useful therapy. Thoughts: He/she ignored me – they don’t like me He/she looks a bit wrapped up in themselves – I wonder if there’s something wrong?